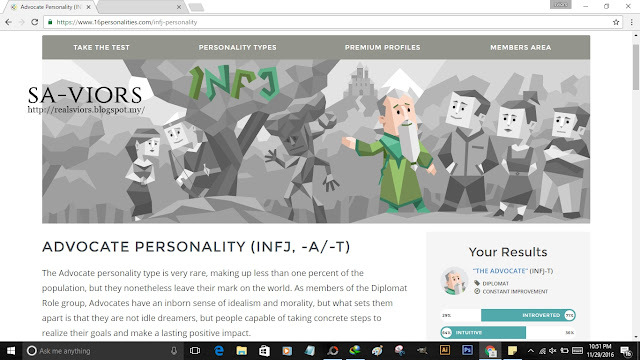 So semalam aku boring then aku pon buat my personality test and this is what I've got; INFJ -T. Hahaha, wow kat situ tulis yang INFJ ni yang kreatif dan perfectionist. 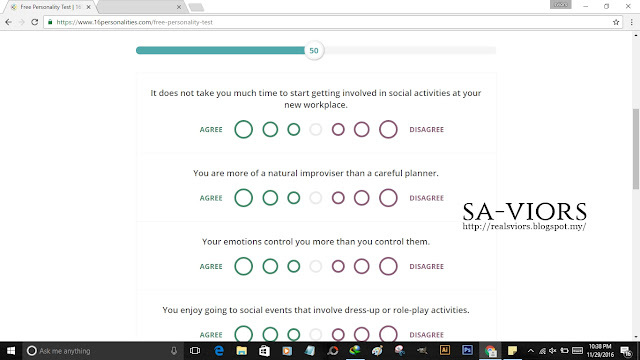 Kalau hampa nak buat jugak personality test ni boleh klik link kat bawah ni and terus jawab + make sure jujur jawapan tu hahaha. 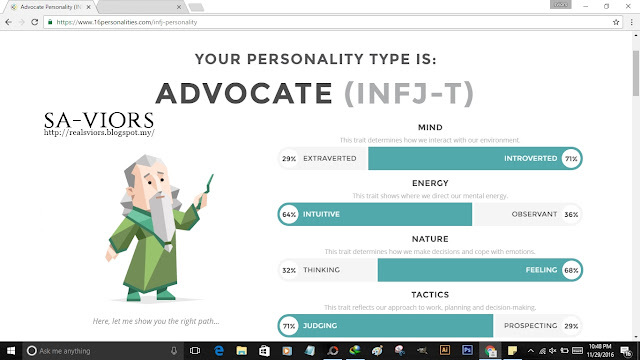 "Making up anywhere from 1 to 3 percent of the population, INFJ is considered to be the rarest of the 16 Myers-Briggs personality types. For this reason, INFJs often struggle with feeling different or weird, and so they often hide large parts of their personality from others, until they feel comfortable enough to reveal their true selves. INFJs are introverts, and like any other introvert, they place a high value on alone time. They love spending time with those they are close too, but need just as much, if not more, time to themselves in order to ¨recharge¨. Even as introverts, INFJs have a strong love of people. They genuinely care about understanding others to the point that at times it can even become an obsession. Since INFJs know what it’s like to feel misunderstood, they spend a lot of time trying to really dissect the personalities of others and understand their true feelings and intentions. This often leads an INFJ to put the needs of close friends and family before their own. It is important for INFJs to spend just as much time paying attention to their own wants and needs in order to live a peaceful and happy existence. Like other idealists, INFJs are imaginative, creative and dream of helping to make the world a better place. INFJs may at first impression come across as overly agreeable, but they have strong ideals and values, especially when it comes to helping others, and stubbornly stick to these values regardless of the person or situation. 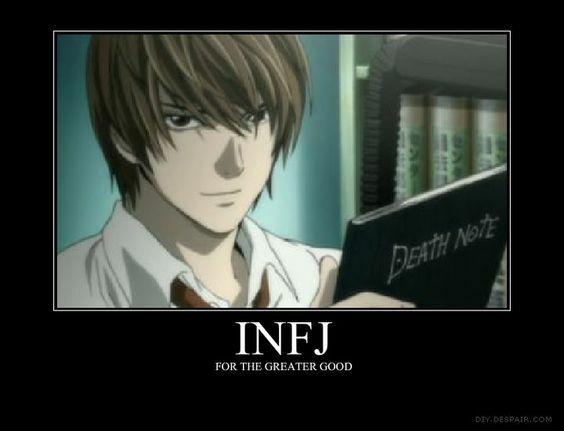 Others are usually shocked to see the side of the INFJ that comes out when their values are dismissed or questioned. INFJs are known as the Counselor type, and it is no surprise that many INFJs choose counseling or a similar field as a career choice. INFJs are potentially the best type when it comes to helping others deal with their problems. Because of their extroverted feeling function, they are able to see the issue from the other persons perspective, but use their introverted intuition and thinking functions to separate themselves from the situation and guide the person down a healthier path. As introverts and feeling types, INFJs are great listeners and genuinely care about the concerns of others, which is a trait that makes them very appealing, and even if it is not their profession, INFJs often find themselves playing the Counselor role among friends, family, coworkers and sometimes even casual acquaintances. INFJs are perfectionists and spend a lot of time thinking about how to make themselves and others better. In relationships, they are best matched with people who share their ideals and also strive for growth both personally and within the relationship. The ideal partner for an INFJ is someone who listens and makes effort to understand the INFJ and who also allows the INFJ to be their true selves without judgment or criticism." So apa jenis personaliti hampa? Komen le kat bawah hahaha mana tau geng. Baru buat since suka buat test gini. Haha. Dpt enfj the protagonist. 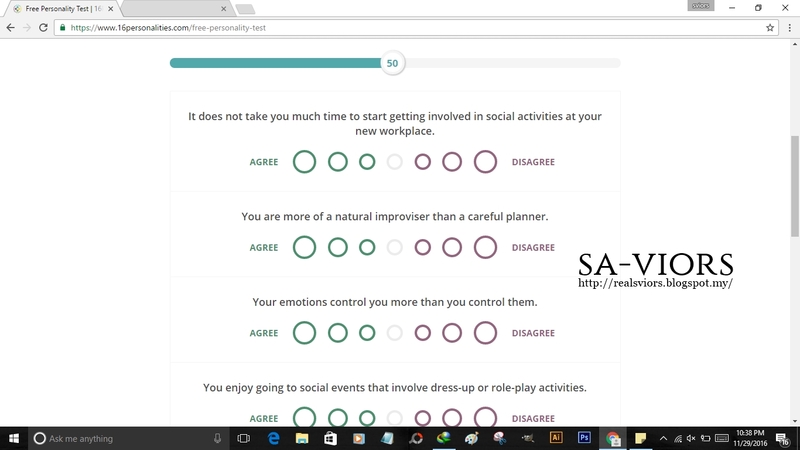 Truly interesting test actually. Kenapa nama myers brigg ni mcm biasa dengarr.